One of my absolute favorite designers is Maureen Cracknell. I have followed her stories and designs for a long time and had the pleasure of meeting her at this past quilt market. We walked over to my booth and had a great time getting to know each other. It was truly one of the highlights of market for me. We talked about making something with my hoop-art designs from her next fabric line, and I am beyond excited to share the first of two hoop art patterns that I designed with her new Garden Dreamer's fabric. I have had these "Over the River" hoop-art designs in my mind for about a year, and when I opened the package of her fabrics I knew it was time to make them. The pattern is available in My Shop. You can view the rest of her Art Gallery Fabric Garden Dreamer's Collection in the Garden Dreamer's LookBook. The colors and patterns are so rich and dreamy...it was perfectly named. 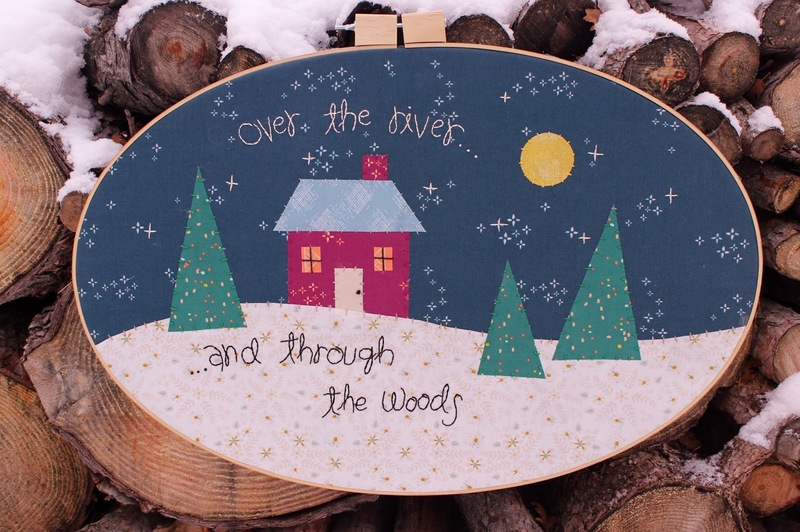 Watch for the second in the "Over the River" Hoop-Art Patterns to come out the first of January. Thank you Maureen for the chance to stitch with your amazing fabric!